All you need is just one glance at a destiny board to realize how many potential avenues of making Albion Online silver (Albion Online Gold) are there. From gathering resources and creating means to do so, to refining and creating weapons and armor to be used in combat, bags, cloaks and other items. Masteries - Masteries are a number on a node of a destiny board that indicates how proficient you are in that specific area of expertise. For example, by clicking skinning crafter node on your Destiny Board you can see what mastery level you currently have and what bonuses you will get by increasing it further. In the case shown below, you can see that each mastery level grants +0.3 bonus to cost efficiency when crafting skinner gear, 0.75 increase in quality when crafting skinner gear, 2.5 specialization bonus to focus cost efficiency while crafting hide knives and +6 specialization increase in quality while crafting hide knives. Out of all the bonuses, focus cost efficiency is the most important one. In short, the higher mastery level the better skinner gear you can create at higher efficiency and at lower focus cost. Focus - You will receive 10,000 focus point throughout the day on any character with an active premium status. Focus points can be used for crafting items by selecting a checkbox while creating a new item. By doing so, players will receive a 35% return on materials they have used to craft that item. In short: if you use your focus points to create something it will cost lest materials. When crafting an item a set amount of focus out of the focus pool will be used (depending on the item) but that number can be reduced with the beforementioned masteries. So, if there are two players with the same amount of resources and the same amount of focus, the one with more mastery levels will be able to create more items. Going further down this road you have to gather (or buy) fewer resources to make stuff so the mastery increase means more Albion Online Silver per hour (called also Albion Online Gold). If you need to Buy Albion Online Gold you can look for offers on our site. For example, you want to sell Tier 6 refined stone for a good profit at Caerlon. To do so you can gather as much Tier 5 stone as you can and then just purchase raw slate (which averages around 250 silver per) and you need four of those to produce Tier 6 block but, when you use your focus you gain 1-2 of that slate (so up to 50%) back from each craft giving you 250-500 silver return on your investment. Then you can sell your refined Tier 6 block for 1300 silver per each one, so you make the math now, with crafting focus each block costs around 750 silver to produce giving you almost 100% profit margin you can spend on Albion Online gold. The profit margin is higher the higher your return is. In short: Mastery Is Profit. You can do this with almost any node on the destiny board, crafting specific weapons, creating specific types of ingots or lumber. You can turn a forgettable resource, like stone, and turn it into silver with just some dedication, and thanks to that, no matter what you craft it will always be in demand, you need lower tier items to create higher tier ones, higher grade stuff gets destroyed and someone has to produce it again and the cycle continues. 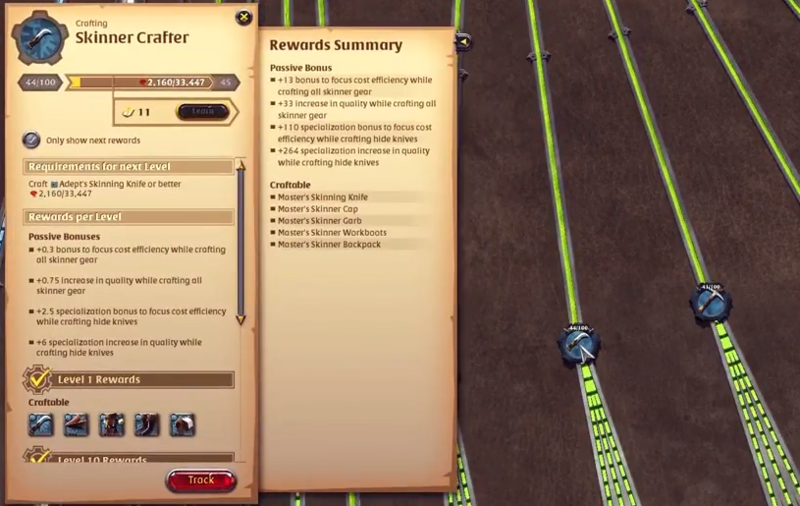 Albion Online has probably the best thought-out crafting system that works, if you are crafter/gatherer at heart but feel like other MMO's cant execute that aspect well Albion Online should be right up your alley. If are willing to spend the time to master one specific node you can turn it into a massive profit, just because you are the best at what you do. So that's pretty much it, if you want to earn Albion Online Silver to sell albion gold or buy Albion Online Gold, Albion Online crafting and Albion mastery and wise Albion focus management are something you should be aware of.